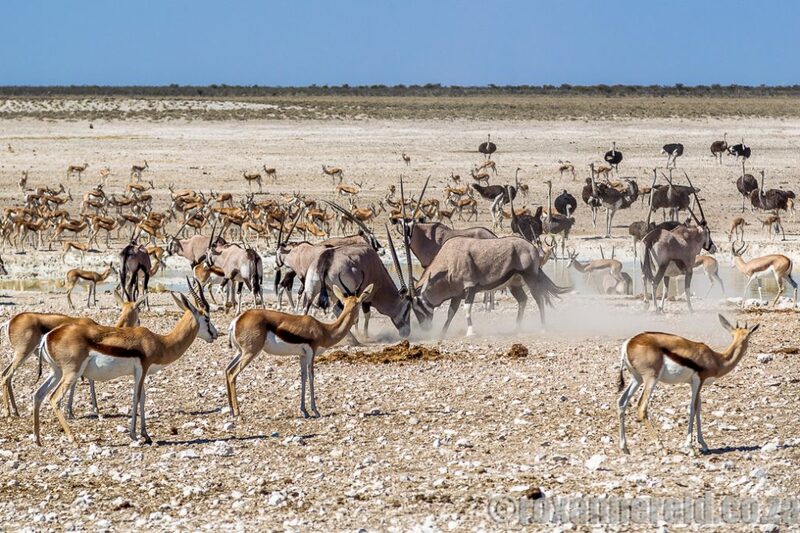 Etosha National Park in northern Namibia is probably one of the best wildlife parks in all of southern Africa, the game viewing at its water holes unmatched. The best time to visit is in the dry season months of June to September when temperatures are usually in the mid- to high twenties (Celsius). This is also when the water holes around the 4800 square kilometre salt pan act as a magnet for animals that need to drink, bringing them close enough for you to get photographs even without a heavy, high-priced telefoto lens. 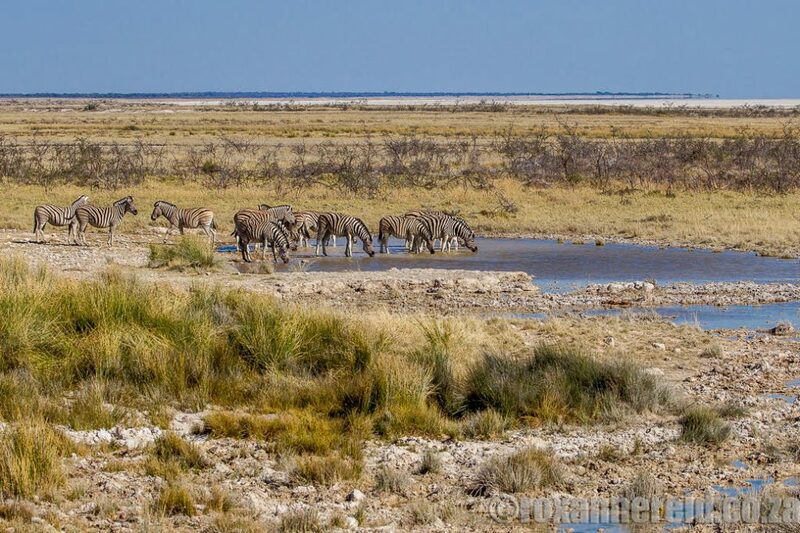 There are more than 40 water holes in Etosha, each with its own strengths – unless they’re dry or there’s water everywhere in the veld after good rains, which usually fall between November and April. For the most consistently good wildlife sightings over the years, here are 10 of my favourites. 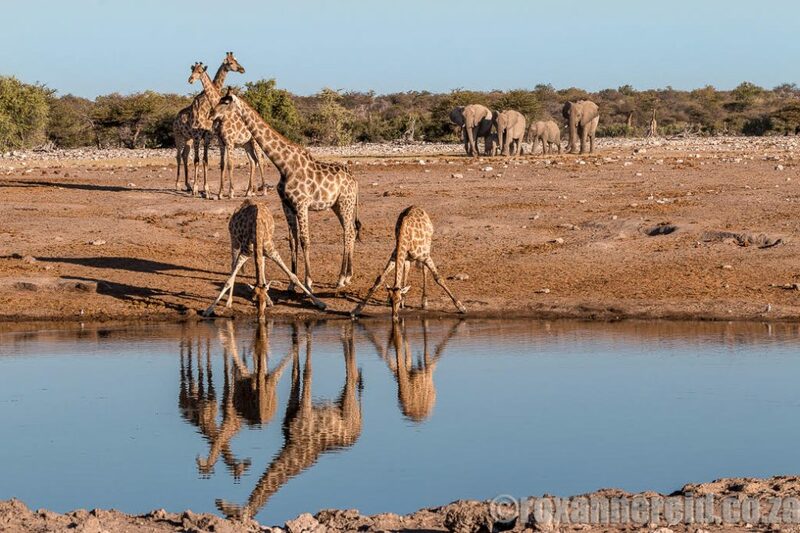 Klein Namutoni waterhole’s greatest asset is that it’s just 2-3km from Namutoni camp, so you can stay there till late and zip back to camp just before the sunset curfew. The bush along the road to the waterhole is your best chance of seeing the tiny Damara dik-dik, Namibia’s smallest antelope. (They don’t need water so don’t look for them at the waterhole itself.) We’ve often seen black rhino, elephant and spotted hyena at Klein Namutoni and there are usually at least a few giraffe. This water-table spring about 7km from Namutoni is set in a depression so you look down on it from the parking area. It’s a regular place to watch giraffes drinking and there’s always some action. 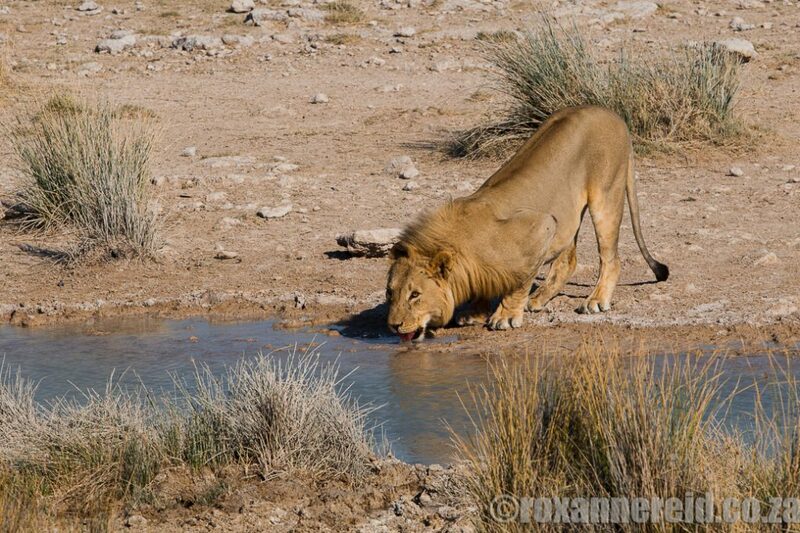 It’s one of the waterholes where you can most consistently find must-haves like lion, spotted hyena and eland. Kalkheuwel is about 20km south-west of Namutoni. Don’t drive in and out without stopping, but sit and be patient. 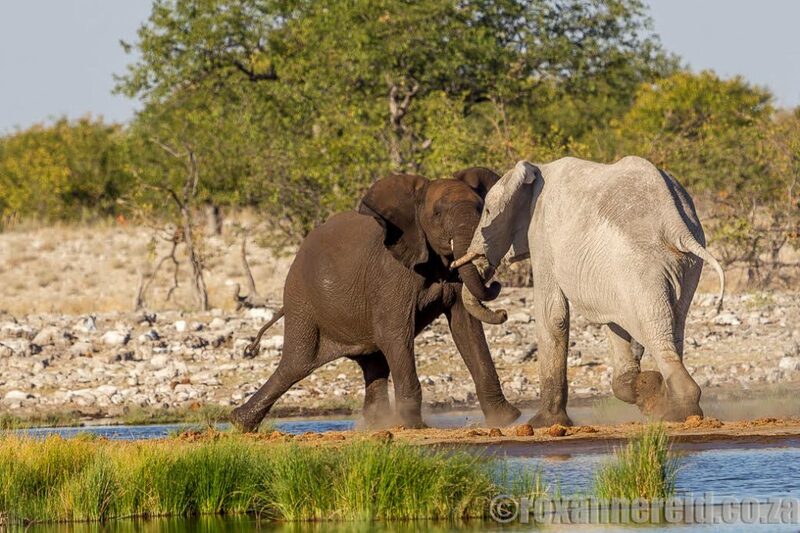 Some of our best sightings have been large breeding herds of elephant, stalking lions – including a lion lifting a zebra clean out of the drinking trough – eland, kudu, black-faced impala aggressively chasing other males away from their harem, warthog families, and the raucous Meyer’s parrot. 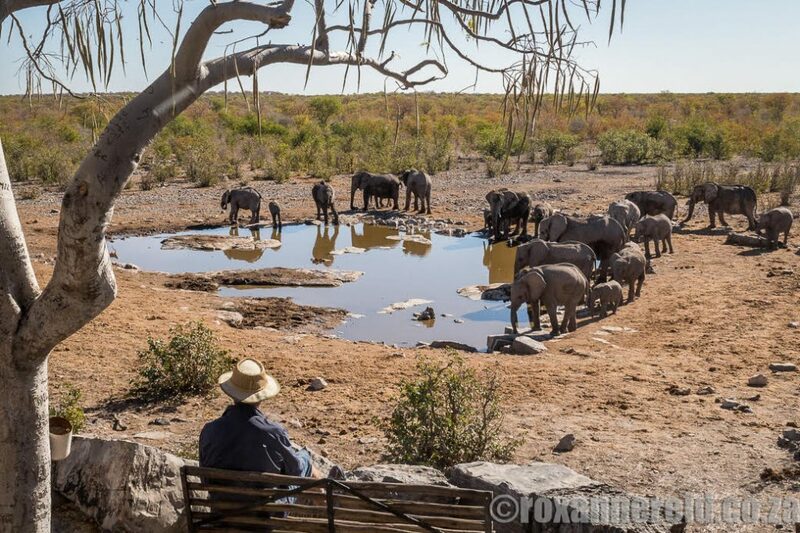 It’s not uncommon to see seven or eight different mammal species at the waterhole at the same time. Halali camp’s secret weapon is the floodlit Moringa waterhole, named after the phantom tree Moringa ovifolia. 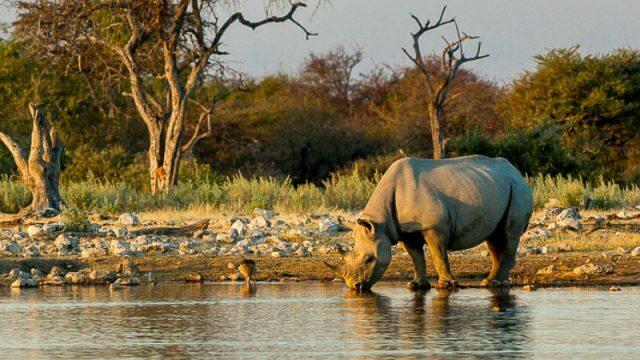 When we stay at Halali, we never miss a few hours at the waterhole in the early morning and evening. Perched on a koppie with an amphitheatre-style view down to the waterhole, it’s one of the best places to see black rhino and leopard. Don’t miss the symphony from flocks of double-banded sandgrouse soon after sunset. At Rietfontein some 20km west of Halali there’s almost always something going on. Last time we were there, we watched 300-400 zebra clattering over the stones, a head-butting match between two elephant bulls, kudu, giraffe, wildebeest, a sprinkling of springbok, whitebacked vultures, a tawny eagle and a fish eagle. It also brought three of my favourite sounds together: zebra, Namaqua sandgrouse and fish eagle. Down a narrow track nearby is the grave of a Dorsland trekker who died here in 1876. 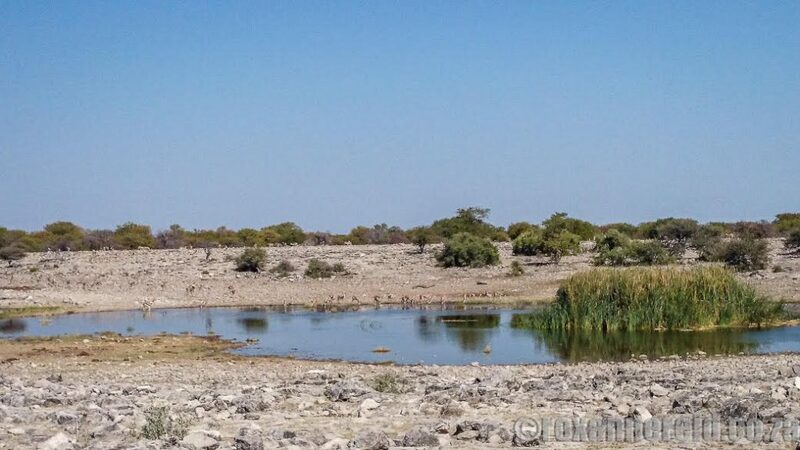 Salvadora is about 27km west of Halali and gives a good view out over Etosha Pan in the distance. 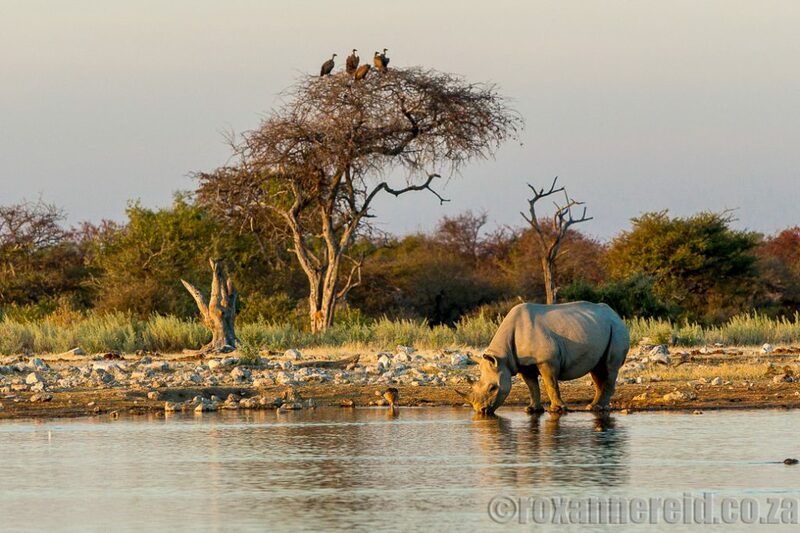 It’s popular with animals because the water here is far less salty than that of Sueda waterhole nearby. It’s a good place to see cheetahs (which may climb into a tree for a better view) and lions. Inquisitive yellow mongoose sometimes come right up to vehicles in the parking area. Charitsaub, about 2km west of Salvadora, is an artesian spring that sometimes dries up late in the dry season. Check the large umbrella thorn tree north of the waterhole for birds of prey like red-necked and lanner falcons. You can often see lions and spotted hyena here and zebra and wildebeest are regulars. Homob is a pretty waterhole 43km west of Halali and about 35km east of Okaukuejo camp. It is in a large depression below the parking area, so viewing is good. Wildlife trails that cross the parking area allow you to see and photograph animals from close by as they walk to or away from the waterhole. 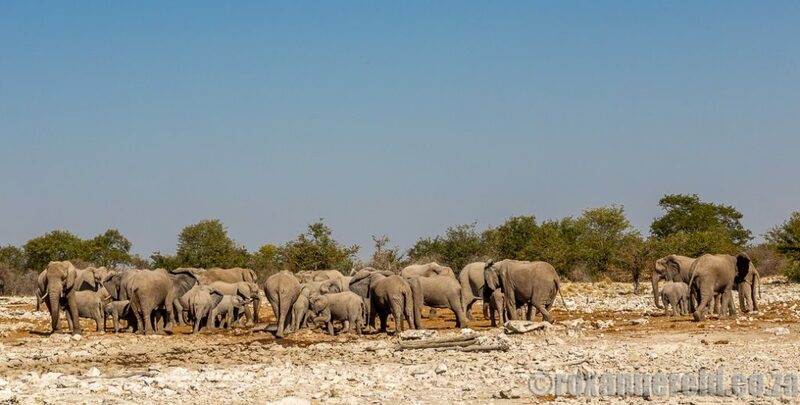 You can see huge gatherings of animals at this waterhole just 7km east of Okaukuejo camp. The area is covered with white calcrete dust, so when elephants that have rolled in the white mud stand still they look like stone statues. On our last dry season visit there were some 500 animals of seven species thronging the overgrazed space around the waterhole. Watch animals come and go 24 hours a day at this floodlit waterhole right at Okaukuejo camp. Sit on a bench behind a protective stone wall and game-proof fence or at the thatched lookout for excellent sightings without even having to leave the camp. 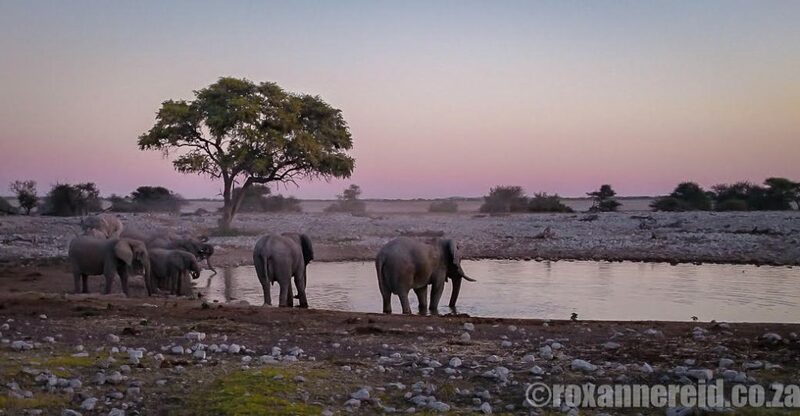 Elephants often come to drink at dusk and black rhino after dark. It’s not unknown for lions to make a kill near the waterhole and then you can watch them for a day or two before they move on.